I made this tasty meatloaf with ground beef and caramelized vegetables. It is another good way to get lots of veggies into your kids diet. 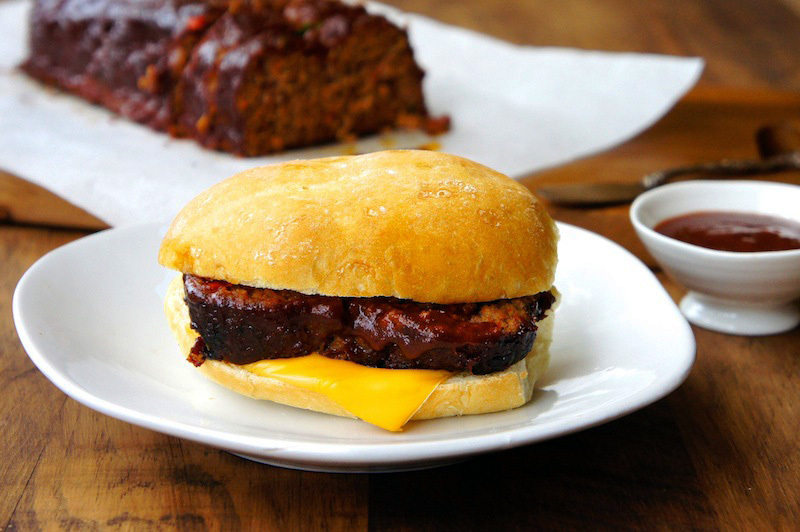 The meatloaf is very flavorful and it's great when served with toasted baguette or rolls as a sandwich, topped off with some cheese of your choice. Yum! Sauté onion, carrots, peppers, and garlic in a skillet until all the vegetables are cooked and caramelized. Let it cool slightly, and puree in a food processor or a blender. In a large bowl, combine the ground beef; mix vegetable puree, eggs, breadcrumbs, chili flakes, sea salt, black pepper, and Italian seasoning. Knead the mixture well until the entire ingredient is well blended. Transfer the beef mixture into a non-stick loaf pan and refrigerated for about 3 hours, or overnight. When ready to cook, preheat the oven to 350˚F. Loosen the loaf with a small knife and flip it over in a baking pan lined with parchment paper. Brush the top with BBQ sauce and bake in the oven for about 1 hour. Pour off all the excess fat and let stand for 10 to 15 minutes before serving. good idea to caramelize and puree the veg, something new to me in making these patties. will try for my next burger batch, love the idea to caramelize them first so the flavours come through. Thanks!